Nancy told me that I needed to update the classes before I left for the long weekend, so here is a quick update. To apply to any of these classes, please visit our website and you will find an overview of the program. More classes open each week, so stay tuned for classes in your area. We now have our classes for the first few months of 2012. To apply to any of these classes, please visit our website and you will find an overview of the program. Register now for these great classes. Remember, you can now apply for back-to back classes! 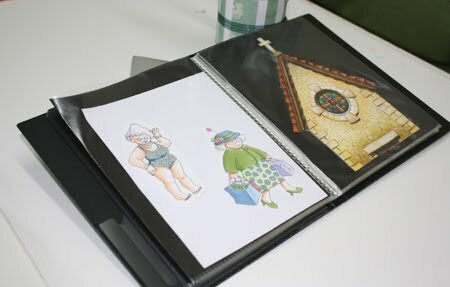 If you have ever met me at a demo or class, you may have had the opportunity to see one of my portfolios. I never travel without them, so if you see me out at an event, just ask to see them. I am always happy to share these, as I appreciate the chance to get feedback or to see what catches people's eye first. As 2012 is getting started, now is the time to work on New Year's Resolutions, and maybe one of those resolutions should be to work on your own portfolio. This new year, I urge you to start a physical portfolio (not a digital one), especially if you have never kept one before. In the Intermediate class, you are given a small portfolio to begin with. Now, in the standard class you are also given one. We wouldn't include these if we didn't think they were so important! If you would like to pick one up similar to the ones we use, you can find them at any art store, or you can easily make your own. (Next week I will talk more about picking a portfolio and what to put in it). Any artist or crafter should keep a portfolio of their best work. This is a tool for improvement, and should not be considered a "bragging book". A good portfolio allows you, and your viewer, a chance to see your best work and give each piece individual, critical examination. By keeping work in one, central place, it is easier to compare and improve quality from piece to piece. 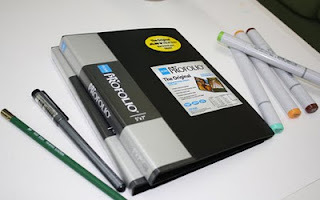 In my opinion, if you are an instructor, you NEED to have a portfolio and be willing to share it with your students. As nice as photographs and blog posts are, nothing compares to being able to see an original work. The computer can be very deceptive, as it interprets colors differently than our eyes and shows work at whatever scale it wants to. Sometimes, you really need to see how big something is in real life, and not shrunk down on a computer screen. Looking at a portfolio is important for both the viewer as well as the creator. Here are some of my personal thoughts on how to be a good portfolio viewer. Give praise but don't gush. When people look through my portfolios, yes, I like to hear "Oh my goodness! That is amazing!" but I would rather hear "Oh my goodness! That is amazing. How did you do that technique?" I want a chance to teach through my artwork. I never want to hear "You are sooo good. I could never be like you." It is nice to compliment, but don't embarass them by going over the top. Give sincere compliments and remember that with practice you could make work like theirs, or vice-versa. A portfolio is not a tool for you to compare your work to another person. This is a self-assessment and feedback tool. Don't look at someone else's portfolio and feel bad about your own work. We are all at different places in our work at different times. A portfolio is of a person's best work, so when you look at it, try not to compare your problem areas with their strengths. Use other people's portfolios as inspiration and learning tools, ask constructive questions (mixed in with healthy praise). Take notes. If you see something you really like, be it the way they shaded an image or colored hair, ask about their technique and practice it. One time I really wanted to work on making round gemstones look luminous. So, I drew an image with lots of round gemstones. Then, I looked through an artbook by James Christensen to color the gemstones. He is an oil painter, and does a fascinating job rendering luminous stones. There are a couple pieces in my portfolio that are inspired by James Christensen. I could not have improved my technique as quickly without studying his work. This is a good use of another person's portfolio (in this case, an artbook). Ask before you photograph. Never photograph someone else's portfolio without their permission, and never publicly display those photos without their permission and without giving them credit. Come back to the notes or photos, then try to incorporate those techniques into your own work. There is a saying in art "Copying is the greatest form of flattery." It is OK to copy techniques and colors you like, but whenever possible, attribute credit where it is due. Sometimes for legal reasons you cannot display photos of their work, as those pieces might be published or the rights might belong to someone else. In that case, you could face a potential lawsuit, so always get permission! Be considerate with your flashes, as original works may be light sensitive. Ask before you touch. If you try to photograph an image and it is behind a piece of plastic, many times the glare will prevent you from getting a decent photo. Or, sometimes, you want to see a technique really close up, or you want to see the back of the paper to see how the ink soaked through. Always ASK before you touch the original. Flipping through plastic pages is one thing, touching the original is another. In libraries, you are expected to wear linen gloves when touching original works. This is because each time you touch an original, your oily hands are transferring grease onto a project. Copic markers do not like oil and grease, so if a person tries to color that art again, it may not react the same. If you must touch an original, touch the edges, and avoid important features. Try not to hover. If it is your own portfolio, you may really want to hear feedback. It is OK to hover and explain your work, but it is also OK to not feel obliged to stand there while they look through it. Be courteous to the viewer and consider if you are being over-protective and hovering. Sometimes that makes them uncomfortable, so try to be aware of their comfort level as well. Next week I will have Part 2 about portfolios, meanwhile, have a wonderful and safe New Year! 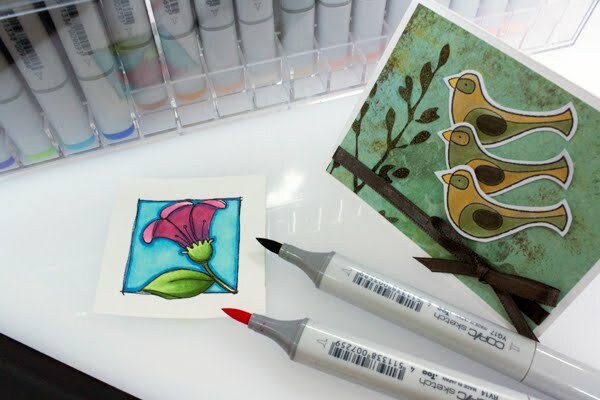 Head on over to the Copic Blog for the color spotlight on B66. Here is the new image I drew for the spotlight post to go along with the tutorial I posted yesterday. 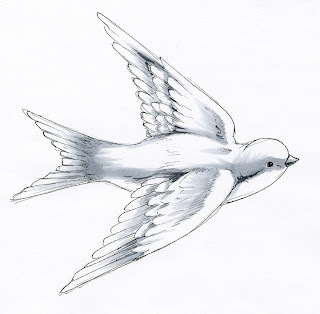 Yesterday's bird was the male swallow, today's illustration is of the female- hence the lighter colored breast feathers. More details can be found on the Copic Blog. I finally got the time to write up the tutorial for the picture I colored last week. Tomorrow, you can see the color spotlight I made this tutorial for. I'm please with this picture because it only took 10 colors to make it look so neat. 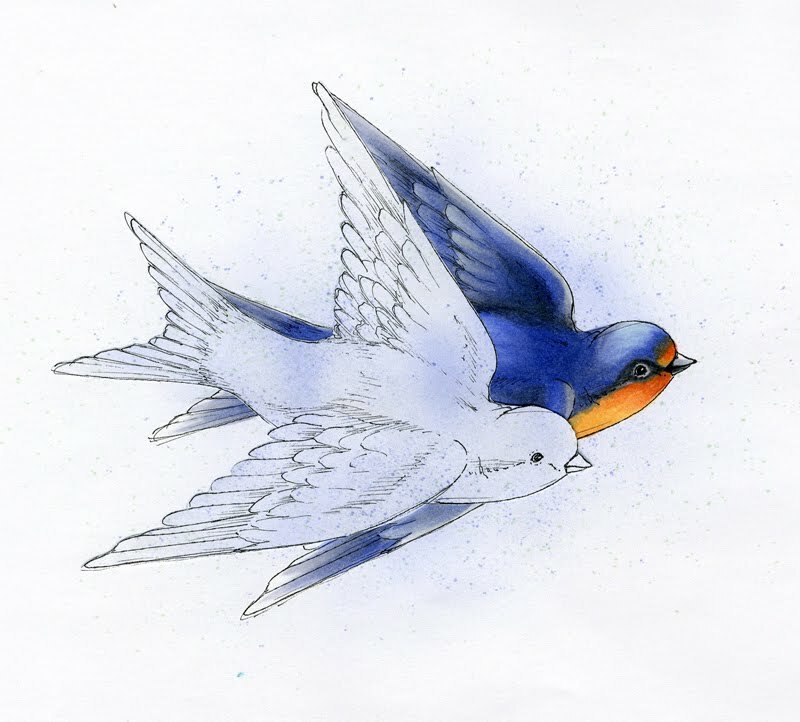 I drew this barn swallow after being inspired by seeing a beautiful Victorian cut-out of one last week. I draw my pictures with pretty simple lines, because I like to rely on the markes for giving depth, however, I like my line work to stand alone sometimes, so added a lot of little lines that I knew would get covered up by coloring. 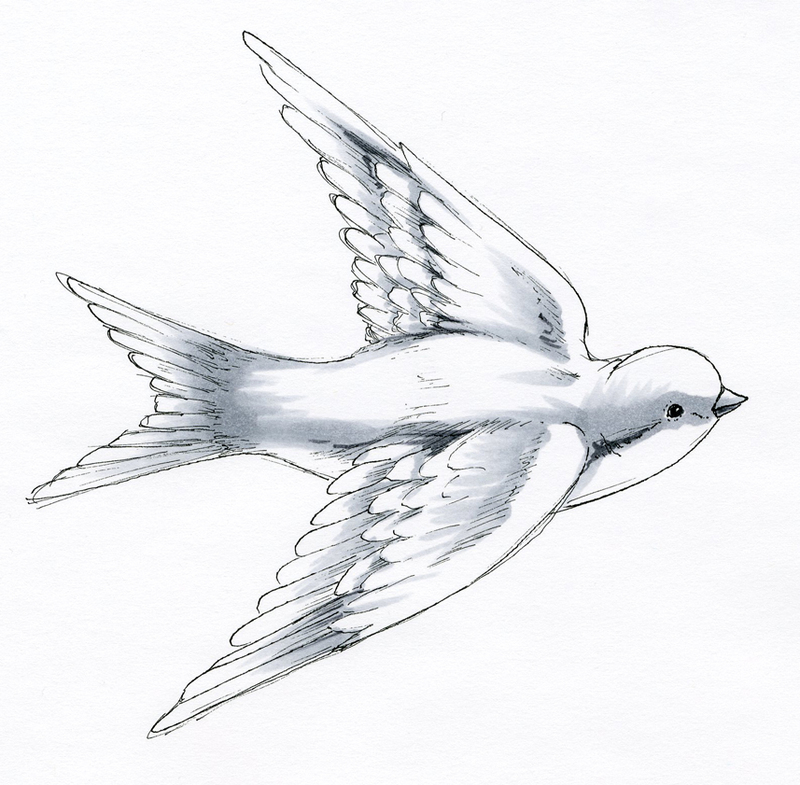 I drew it with a 0.03 mm Multiliner SP, then photocopied it a couple times before I colored it. For coloring reference, I found this amazing website by photographer Rick Cameron. I started with a simple base of grays to define my shadows. I don't have strong shadows in this illustration, because I wanted the top of the bird well lit, but I also wanted to showcase the vibrant belly plumage. I started with C3 and BV23. BV23 is my favorite alternate for C5...it is more purple and adds a little more richness to my cool grays. Next, I feathered in a light base blue of B91 and B63. I layered B66 over that, (B66 is the color spotlight color that I'll feature tomorrow). I deepened the blue with the BV23 and C7. I did not blend much, rather, I kept my strokes in the direction the feathers grow so it looks more like natural color variation. I darkened around the eye with C7, and darkened the wings with BV23 and C7. Again, I did not blend, instead I simply layered and feathered colors together . 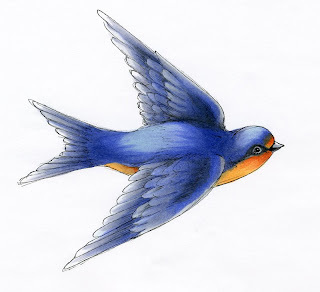 The top of the head is the only area where I blended the colors, as that is a very smooth area of feathers. Next, I added my YR's. 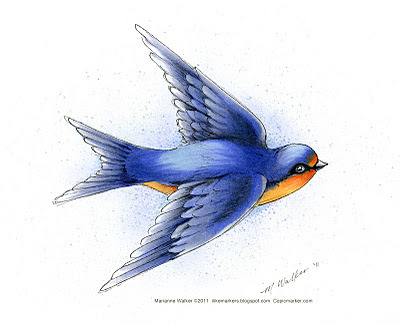 In looking at the photos of barn swallows, I noted that their chests are pale orange to brighter orange, depending on gender. I wanted a base that was not too vibrant, so I went with YR31. Then, I blended in YR12 and YR18. The YR18 was a perfect match for the photos I found online. At this point, I held my image at arm's length and squinted...was it dark enough in the shadows? Did it look right overall? This is the point of self-critiquing that we discuss in the Intermediate Certification classes. 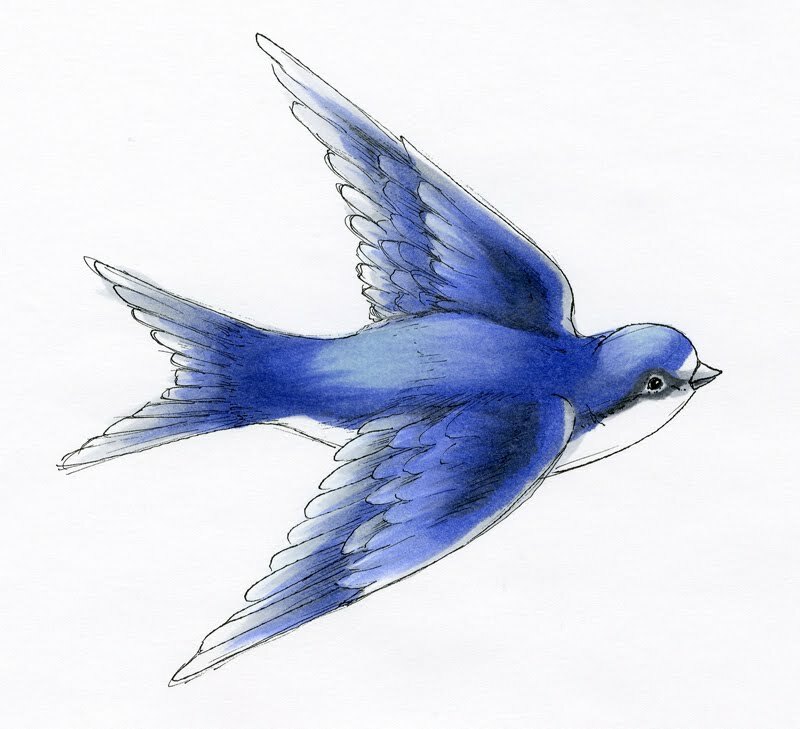 This is also the point when I would clean up any spots where I went outside the lines (look at the gray tail feathers and how I fixed the mistake). Last I needed to add a background of some sort. Usually I would just add a simple blue fade to suggest sky, but I didn't want to overwhelm someone with that much blue, so I decided to go more stylistic on my sky. I made a mask from one of my photocopies of the bird and attached it firmly with some weak double-sided tape. Using the chisel end of the B63 I added a faint blue around the bird, getting darker closer to the bird. Then, I added larger speckles with the brush end of the B63 and a G12 marker. By airbrushing very lightly from a brush end, you can get larger speckles than if you airbrush directly with the chisel. 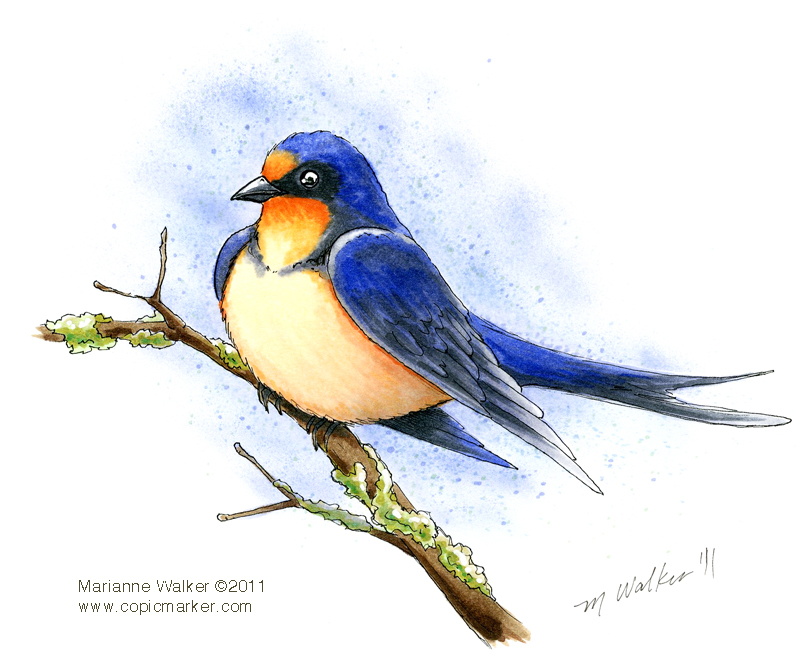 After I was content, I added a final touch of Opaque white to the eye and beak. Here is the final swallow. As I mentioned earlier, be sure to check out the color spotlight later this week on the Copic blog for other color combination suggestions for B66. I have a lot little details to update today, so we shall see how much I can get through. Then, hopefully, I can get a tutorial posted tomorrow. Meanwhile, here are all of the upcoming certification classes around the world. New Certification Information for 2012! This Fall we have changed our policy regarding attending the Standard and Intermediate classes back-to-back. Many users have had our markers for many years now and have been happily coloring. However, there may be tidbits that you do not know about the Copic system, which is why we need to have a standard level before getting into the nitty-gritty of Intermediate. We still require you to have attended the Standard Certification before the Intermediate, but now you can take them back to back (Note: We do not recommend it, as we cover a lot of information in those classes). 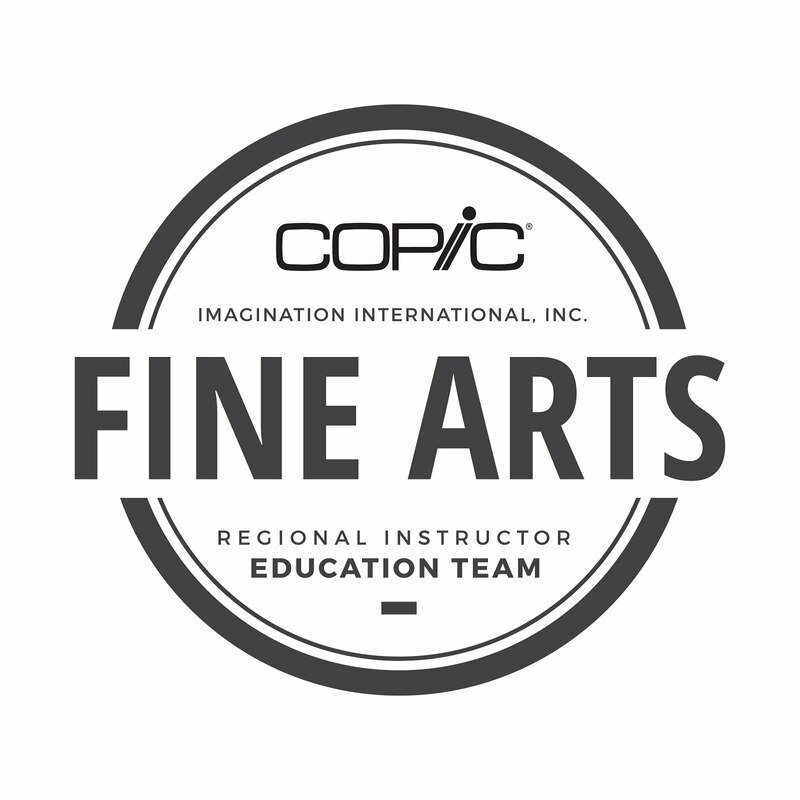 In January 2008 I taught the first Copic Certification. The standard certifications taught up to this point have not varied much from that first class. Only the literature has improved, the content has been the same. With 2012 we are re-vamping the program. The same concepts will be covered, but the timing and supplies will be different. In 2008 there were few papecrafters who knew about Copic Markers and how to effectively use them. Today, the average attendee in our Standard Certification has a lot more information available before they attend our class, more now than ever before (thanks in large part to all of you who already have been certified and have been spreading the word. Thank you!). If you attend the Certification this year, we will be switching to a portfolio format, similar to the format we use in Intermediate. There will be more coloring and a different assortment of products in your product pouch. We strongly suggest that you indulge this year and re-take the certification, especially if you want to brush up on your coloring skills. For all North American Residents, you can register for classes directly from our website. 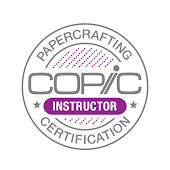 In many countries outside of North America, there are opportunities to take Copic Certification classes. As new regions establish their programs, I will try to announce their classes as I hear about them. 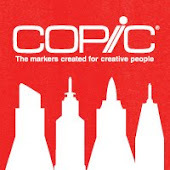 If you are European, check out the Copic blog for Europe. New classes for 2012 have not been announced yet. If you are interested in keeping up with some fabulous tutorials, contests, and finding out what events are going on in Australia, please visit the Australian Copic blog.